Home » Addenda or Addendum – What’s the Difference? Let’s say you have just written a book. You are a fantastic writer, and you have a captivating story to tell, so the book sells millions of copies. A few years later, your publisher wants to release a new edition of the book to make even more money. They ask you to write a short note reflecting on anything that has changed for you since the first edition. If you put the note before the original text, it would probably be called a preface or an author’s note. If you put it at the end, it would probably be called an addendum. Let’s say that a few years later, the process repeats itself and you write another note. Now you have two. Is the new one still an addendum, or are they addenda now? 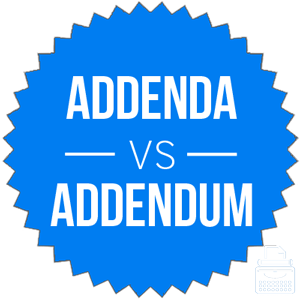 If you aren’t sure about the question of addendum vs. addenda, you aren’t alone. Many writers don’t know the difference between these two words. What is the Difference Between Addenda and Addendum? In this post, I will compare addenda vs. addendum. I will use both of these words in example sentences, so you can see how they appear in context. Plus, I am going to use a mnemonic device that you can also use when you need to remember whether addendum or addenda is the correct word. What does addendum mean? An addendum is a note at the end of a piece of text, like a letter, a book, or an article. Authors might include an addendum if they notice an error in something that they already sent out or published, or if new information comes out, or if they simply forgot something. The word addendum is a singular noun. It comes, like so many English words, from Latin roots, and it was first recorded in English in the mid-17th century. When I publish the second edition of my bestselling cookbook, I will include an addendum with updates to the original text. In the addendum, the author admitted that his viewpoints had changed since he first wrote the book. What does addenda mean? Addenda is the plural form of addendum. If you have more than one addendum, use addenda, not addendums. For some reason, addendums is becoming slightly more popular as time goes on. Addenda is still used much more frequently, though, and you should stick with it, as well. Likewise, if you have only one addendum, you should use addendum, not addenda. Addendum is only ever singular, and addenda is only ever plural. The forms are never interchangeable—addenda is always plural and never singular. The opposite is true for addendum. Since addendum contains the letter M, like the prefix mono- (which refers to one of something), you should find it easy to remember that addendum refers to only one of these things. Is it addenda or addendum? Addendum is a noun that refers to a note added to the end of something. Addenda is its plural. The usage cases are entirely separate; they cannot be substituted for each other in any contexts. Use addendum in the singular form. Use addenda in the plural form. 1 What is the Difference Between Addenda and Addendum?